What goes into a successful disc procedure? A herniated disc in your lumbar spine can be very painful. The good news is it often resolves with conservative treatment, which generally consists of physical therapy in combination with pain medication and/or muscle relaxers. If non-invasive treatments such as these don’t fully do the trick, you may still be able to avoid surgery with a steroid injection. After six weeks of non-invasive care without satisfactory results, it may come down to surgery. In this case, a discectomy may be all you need to achieve the relief you seek. But surgery is surgery. As with any type of procedure, you likely want to feel confident that your doctor is paying attention to the details and has your best interests in mind. In that case, here are 10 things that he or she should get right. MRIs are frequently used when determining if a disc procedure is needed. But that’s not the only value of this technology. Your surgeon will likely refer to your films as she assesses your spinal anatomy, disc chemistry, the degree of degeneration present in your spine, and to determine if your disc herniation is contained or not. Disc containment is an important characteristic in determining not only the need for surgery, but also for pinpointing the appropriate procedure. But a 2008 study published in the Journal of Orthopaedic Surgery found that MRIs may inaccurately assess disc containment status in up to 30 percent of spine patients. The study authors recommend combining MRI films with other diagnostic methods before making the final determination as to whether a disc surgery is warranted. Now that you know what the problem is, plus the extent of it, the next thing to be clear about with your doctor is the surgical procedure she plans to perform. In general, a microdiscectomy is the surgery of choice for a simple lumbar disc herniation; it's known for its excellent results in many cases. But it is not the only type of disc surgery available. New procedures are continually being developed, and one may be more appropriate given your specific situation. Types of disc surgeries include but are not limited to open discectomy, laser spine surgery, and sequestrectomy. And if your spine is unstable, you may need an entirely different procedure altogether. Many factors go into matching a procedure to an individual patient. Given that, you might want to ask your surgeon to share with you the medical research studies that have looked at both your diagnosis and the proposed surgical procedure. Another bit of knowledge that may be helpful is how often—and for how long—your surgeon has been performing that particular surgery. Is Your Spine Stable Enough for a Disc Surgery? Some spinal conditions are accompanied by column instability. Generally, a herniated disc is not one of these, but it’s best if your surgeon does a thorough job of evaluating you anyway. Otherwise, you may be risking a more serious problem—and more pain. If the results of your physical exam given by your doctor are inconsistent with what the MRI shows, an astute surgeon will likely take steps towards ruling out lumbar spondylolysis. Spondylolysis is a stress fracture in a part of the spinal bone called the pars interarticularis. When a pars fracture is not treated, it may progress into a full-blown case of spondylolisthesis, where one spinal bone moves either forward or back of the bone below it. How does a surgeon tell your pain is coming from your disc and not spinal instability? By identifying where on the nerve root the compression is occurring. According to a 2016 study published in the Asian Spine Journal, generally, lumbar disc herniations tend to affect the lower part of the root. A case of spondylolysis (that also has symptoms) tends to compress the upper part. One exception to this rule of thumb that may confuse things a bit is if you have a far lateral lumbar disc herniation. The study authors say this type of herniation affects the upper nerve root. Is Your Sciatica Really Caused by a Herniated Disc? Herniated disc is a common cause of what many people refer to as sciatica. In this case, the technical term is radiculopathy, indicating that compression or irritation of a spinal nerve root is what's behind your pain. But sciatica can have a number of other potential causes that are not related to herniated disc. These may include piriformis syndrome, ankylosing spondylitis, facet joint hypertrophy and even certain diseases in other systems of the body that mimic the symptoms of radiculopathy. 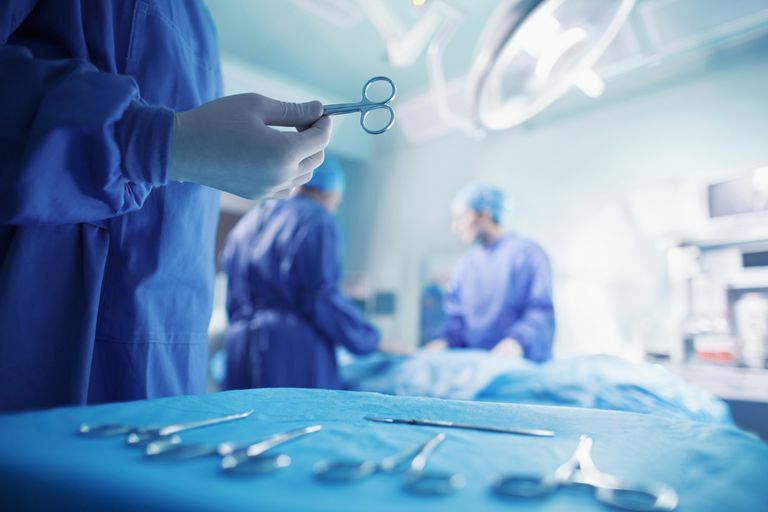 Getting you ready for a discectomy or other lumbar disc surgery, keeping you safe during the procedure, and making sure everything is as it should be after the fact involves a number of steps and medical protocols. Any one (or more) of them may go wrong. Prior to the procedure, your surgeon's team is responsible for a number of safety measures including: Informing you of potential complications of surgery, monitoring and managing all your pain medication—you may need to stop taking some or all of them just before you go in—and positioning you safely. The focus turns to the type of equipment used and the way in which it is handled while you’re on the operating table. For example, bringing the surgical instruments too close to the disc, working too fast, or working with too much force are all things that may lead to complications. What you do after the surgery matters to your healing. Returning to work either too soon or not soon enough may affect your recovery, as may not getting the right kind of post-procedure rehabilitation or physical therapy. Other things that make a difference in how well you can get back into the swing of things include gaining weight and exerting yourself too hard too soon after surgery. Your doctor should discuss all of these factors with you. Do You Make a Good Surgical Candidate? At first blush, it would seem that the results of a back surgery—whether good or bad—are attributable to physical factors. These may be things like where the disc herniation is, what procedure is being done, and more. But mental health issues, especially anxiety and the desire for secondary gain play roles as well. In particular, they may contribute to poor surgical outcomes. As far as secondary gain is concerned, examples include the need to relieve guilt associated with your disability, or having an excuse for not going to work. Most lumbar disc herniations are sustained at either L4-L5 or L5-S1, and surgeons are generally able to discern those levels in their patients. But anomalies in the anatomy sometimes occur and this can make it more difficult to precisely locate the area that requires the procedure. Herniations that occur at levels other than these, namely L1-L4, may also be at a higher risk for this error, as well. If your surgeon exposes the wrong level during surgery, but realizes it and then proceeds to the correct level, it’s possible that the damage may be minimal. But if she proceeds with the discectomy at the wrong level, realizes it and either sews you up, or also operates on the correct level, it could lead to problems you would not have otherwise had, such as degenerative changes or spinal instability. And if a fusion was performed in the wrong place, a permanent lack of mobility not otherwise warranted may result. Believe it or not, and according to a 2017 study from the United Kingdom, performing an operation on the side of the body that is not associated with the lesion (the term lesion refers to the problem you're having, and that causes the pain) is the most common type of wrong site error. And even though healthcare efficiency experts have been addressing wrong site and wrong side surgery errors for a while, the number of these errors has not gone down. The study says that over 72 percent of wrong site errors were due to surgery done on the wrong side. And a 2014 study found that the side the surgery is to take place is often missing from the paperwork that travels with you on your medical journey. This might be the clinical letter, your consent form, or other documents. You can make things a little safer for yourself if you look for this critical information in your consent form before you sign it, as well as remind your doctor as she makes her notes. The study also advocates that surgical teams use the WHO (World Health Organization) surgical safety checklist. According to the authors, this checklist has been very effective in minimizing the wrong site surgery at the NHS. You might ask your surgeon about that, as well. Marking the area with a sharpie is another tactic used by surgical teams. Just because you have back pain doesn’t mean you need a disc surgery. Other problems may be underlying the pain that do not require surgery. Perhaps the best example is if your symptoms are due to degenerative changes in your discs, a common condition that may resolve with physical therapy and medical management. Spine surgery is big business these days, and your doctor may stand to benefit if she is able to convince you to have a complex surgery rather than a simple one. Of course, the techniques used and their complexity depends on what’s happening in your disc, but if you don’t understand your diagnosis, you may be agreeing to unnecessary treatment. In general, if you have more back pain than leg pain and/or your diagnosis includes Modic endplate changes, you may be a candidate for more in-depth surgical procedures. Otherwise, a simple disc herniation may only need a microdiscectomy. Speak honestly with your doctor to assess your options. Well, phew! That was quite the list. If your head is spinning or you’re wondering how to fit in all those questions in the short time you have in your pre-surgery consultations, be sure to address whether or not you’re a fit for the procedure your doctor is suggesting, or if you are a fit for surgery at all, given your individual health picture, and if the procedure is the right one for your particular disc injury. Grevitt, M., et. al., Do first impressions count? A comparison of subjective and psychologic assessment of spinal patients. Eur Spine J. June 1998. Hanchanale, V., et. al. Wrong site surgery! How can we stop it? Urol Ann. Jan. 2014. Morgan, M., M.D., Sensitivity and specificity. Radiopaedia. Omidi-Kashani, F., et. al. Ten Important Tips in Treating a Patient with Lumbar Disc Herniation Asian Spine J. Oct. 2016. Weiner, B., et. al., The accuracy of MRI in the detection of Lumbar Disc Containment. J Orthop Surg. Oct. 2008. Medical Ozone Therapy: Can It Help Your Spine? Causes of FBSS: Why Does Back Surgery Fail? What Is Radiculopathy and Why Does it May Your Leg Hurt? Does a Referral to a Spine Surgeon Mean Surgery?